Internationally pre-eminent museum and integral workshops devoted to electrical timekeeping and the distribution of accurate time (1840-1970). Practical education and conservation in action. For decades, James and Luci allocated part of their home to the housing of an internationally important collection of electrical horology, available to view by appointment. Eventually the need for a separate home for the clocks emerged, and this has been provided with the creation of The Clockworks, the conversion of the ground floor of a mid-Victorian printworks in the heart of West Norwood. The upper two floors had been converted to flats by a developer, while James and Luci took the shell at street level as a blank canvas on which to develop their vision for a unified museum, meeting point, library and a state-of-the-art workshop for high-end conservation and repair work. To realise that vision, they enlisted the aid of local architect, Mick Crowley, who had successfully completed The Clock House project a decade earlier. Mick provided a design and use of the space that creates a superb gallery space, retaining a seamless connection with the associated workshop and meeting area flanked by display shelves. Modern materials and components complement the nineteenth century light-industrial character of the building. Where possible, brickwork and steel ceiling joists have been left exposed. The floor is of wide oak boards. Vitsoe display shelving and room dividers define the entrance ramp and library area. The main finishing workshop is divided from the display area by a long bench decorated in electric orange catalyst lacquer. The walls of the cleaning workshop are lined in high gloss white ceramic tiles. With its snaking mechanical extract ducts and stainless steel surfaces, the cleaning room could be mistaken for an esoteric clinic rather than a rare facility for precision conservation and repair. 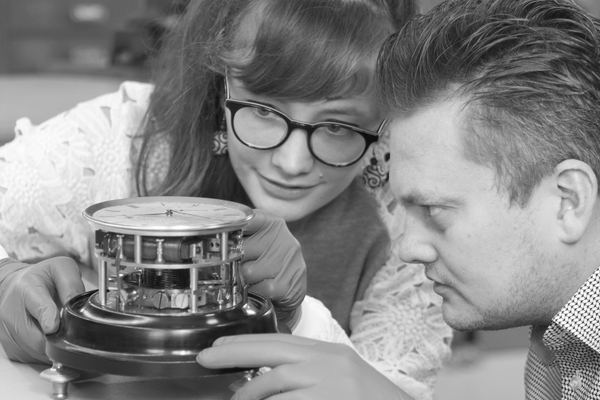 The Clockworks is a world-recognized centre for all matters associated with the technical history and development of electrical timekeeping, and the conservation and care of relevant artefacts.